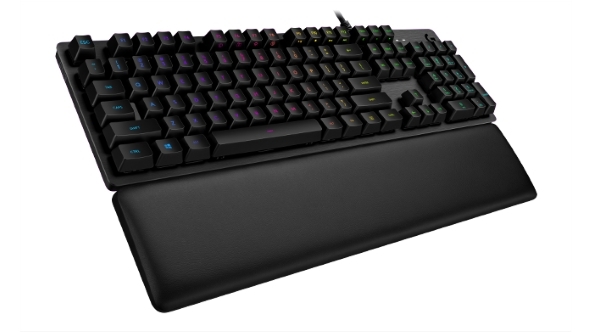 Logitech’s G513 mechanical gaming keyboard oozes premium. While similar to the G413 from last year, Logitech have delivered a more sophisticated experience and a whole new key switch with the G513. Ready to make the change to mechanical? Here are the best gaming keyboards of 2018. The Logitech G513 keyboard comes with your choice of either the Romer-G tactile switch – a quietly bumpy switch that’s been around the block – or the brand new linear switch. Both feature the same 1.5mm actuation point and 45gf actuation force, but linear maintains that smooth action that is reminiscent of the popular Cherry MX Reds. The G513 also comes with gratuitous 26-key rollover should you sprout any extra hands anytime soon. Included in the box is also a memory foam wrist rest. I’m a little smitten with these cosy supports, and Logitech have put together a fantastic minimal black wrist rest for the G513 that rivals the very greatest. Unfortunately, this lightweight leatherette slab features no mechanism to attach it to the keyboard itself, and despite Logitech attempting to sell that as a feature, I’m not convinced. The keyboard itself is almost identical in most aspects to the G413 of yesteryear. It features a deep-grey brushed 5052 aluminium-magnesium facade, which sits atop of a plastic chassis. Like its understated sibling, the styling remains subtle across the other defining features. The black accented Logitech G logo and indicators, the black keycaps, the black cabling, and recessed USB 2.0 passthrough all serve to minimise design distractions from the main event (and the discerning factor between the two models): RGB lighting. 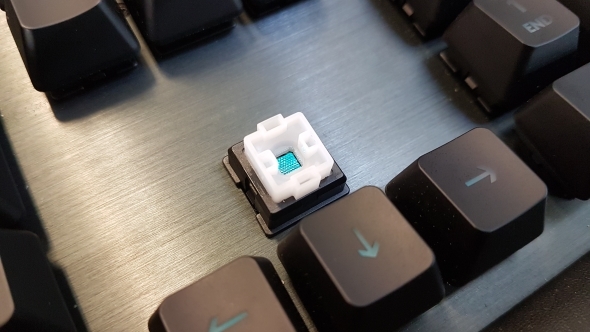 Thanks to the Romer G switch design – which places an LED within the central channel of the hollow key rather than outside of it – the RGB lighting is visually clean and consistent as it shines through the keycap. The lighting is far more localised this way preventing light from spilling out from under the floating key design. The subtlety of the keyboard dramatically aids in contrasting the illuminated keys against the dark facade, and the G513 looks strangely upmarket even with the RGB lighting ablaze. 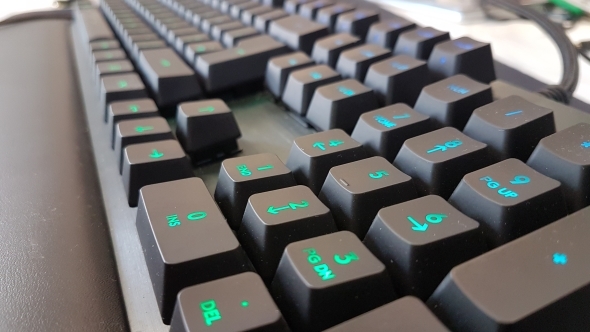 The keycap font is crystal clear, which accentuates the lighting further, and even with the lighting switched off the slightly dimmed translucent design on the keycaps lends well to the board aesthetic. While the Romer-G gaming keycap hasn’t made an appearance (thankfully), Logitech have seen it fit to include 12 additional concave keycaps. It’s a shame that there’s not a single dedicated media key in sight. While media shortcuts are clearly marked on the side of the relevant keys – and easily inverted within the provided software – a volume wheel wouldn’t go amiss. It’s certainly one of the features that most other high-end boards at this price range have deemed essential, and is noticeable lacking from the G513. The Logitech G software allows for the usual fanfare of RGB lighting, sync, and macro control. There are plenty of effects to choose from, but the app also offers game-specific lighting profiles to accentuate certain controls or themes for a good couple hundred titles through Logitech’s Lightsync feature. Priced at $150 / £159, the Logitech G513 competes with the gaming keyboard nobility. The quality is nearing excessive, and the inconspicuous design is sublime compared to the usual gamer aesthetic. However, the pricing can be difficult to justify unless you are head over heels for RGB or in dire need of a wrist rest, especially when the G413 – an almost identical board with similarly minute attention to detail – is so much more affordable. 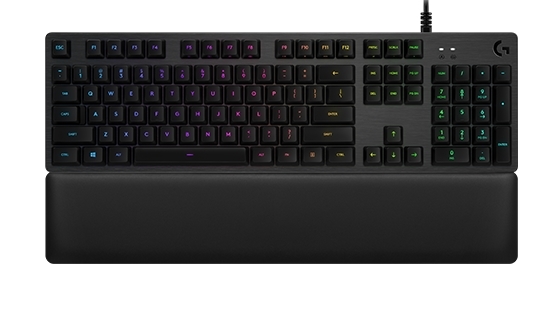 Despite a somewhat expensive RGB premium, you’ll struggle to find a keyboard that is so excessively engineered as the G513 from Logitech. They’ve enhanced the Cherry RGB switch with the linear Romer-G in a way that is almost impossible to follow by competitors, and the G513 is as stylish as it is well-built. All in all, these factors lend to a style that is both minimal yet innately Logitech. The G513 builds upon a rather strong foundation of its predecessor, the G413, which is both a blessing and a curse. On the one hand, it’s exquisitely built, and the design is unmatched; yet on the other, the price premium weighs heavily on the included wrist rest and RGB features, which are pricey commodities (compared to the competitively priced G413) no matter how well-received they may be. As a complete package, however, the G513 feels built to last and well worthy of its price tag.